The Soulshaker is Rick Vito’s third signature model from Reverend. It’s tailored to his unique brand of slide blues with some key neck features. These include a single-action truss rod – that takes weight off the neck – and a smooth satin finish on the neck’s back. Elsewhere, the guitar is loaded with two custom humbuckers that are emblazoned with Vito’s deco triangles. These stylish markers are matched with a black-and-white checkerboard binding, a pearloid top available in shades of ivory or grey, and an ebony fretboard. Rounding out the axe’s features is a reliable Bigsby trem system with a soft touch spring and roller bridge. 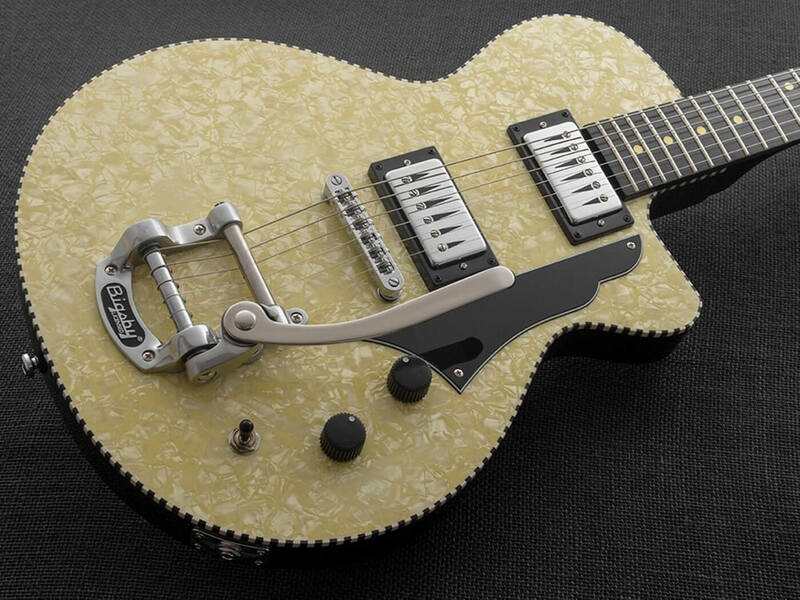 This guitar marries vintage inspiration with modern innovation. It features a T-style body – it’s larger than a Classic T, though – as well as a raised center ridge and a chamber under the pickguard. The latter two features contribute to increased sustain and better resonance respectively. It also features a compound radius roasted maple neck, that has been heat treated so it’ll require less seasonal adjustment. Elsewhere, the axe is loaded with a Fishman Fluence Signature Series Greg Koch Gristle-Tone pickup set. These active pups are rechargeable, touted as hum-free and offer two distinct Fluence voicings. As for hardware appointments, the Gristlemaster sports a Wilkinson Classic 3-Saddle bridge with staggered brass saddles and a steel baseplate. Available in Bluecifer, Pow Yellow, and Wow Red finishes. Lists at $1,919. The Trickshot features a Charger body shape and Talnico single-coil pickups that are voiced for a sweet, early-50s twang. The neck pup is reverse wound to enhance hum-canceling properties when used with the bridge pickup. A bass contour knob, which is nothing new on Reverend designs, is present to tighten low-ends or add a layer of versatility. Finally, the guitar also boasts a String-thru body bridge with stainless steel saddles that cater for extra sustain and bite. Available in Natural, Metallic Alpine and Burnt Brick finishes. Lists at $1,079.